Oxbow’s complete and balanced hamster & gerbil food is formulated to meet your pet’s unique nutritional needs. 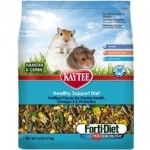 KAYTEE® Forti-Diet Pro Health® is a Nutritionally Enhanced Daily Diet that provides the essential nutrients your pet needs for a long, healthy life. Premium blend of seed designed specifically for dwarf hamsters.